Some people are still disputing the authenticity of Marie Antoinette’s last letter, which she wrote a few hours before her death and addressed to her sister-in-law, Madame Elizabeth. Many historians, during the course of the centuries, believing the letter had really been penned by the unfortunate Queen, have tried to dispell the doubts. It will be pointed out that the psychology of this letter differs altogether from that of the mass of Marie Antoinette’s little scribbled notes, and equally from her serious political drafts and despatches. Critics will very probably be found to dispute the possibility of such a woman at such a time producing such a document. The style fits ill with what she was in Court just before it purports to have been written, and also with what she was on her way to the scaffold just after. Most important of all, perhaps, the sentences are composed in a manner quite different from that of any other letter of hers we possess; they have a rhythm and a composition in them: the very opening words are in a manner wholly more exalted and more rhetorical than ever was her own. Now this Courtois had been one of a Commission named by the Convention to examine Robespierre’s papers after the fall of Robespierre on the 28th of July, 1794. He was what the French call the Reporter of the Commission — that is, the director of it — and it was called the “Courtois Commission.” The Commission published their report of what they had found in Robespierre’s house. It was a report two volumes in length for which Courtois was responsible, and of which he was practically the author. This minute and voluminous report made no mention of the Queen’s letter. Not a word is heard of it during all those twenty-two years until the aforesaid Bill of Amnesty is before the French Parliament of the Restoration and the regicides, including old Courtois, passing his last days on his comfortable estate, are to suffer exile. Then for the first time the Queen’s letter appears. On the 25th of January, 1816, Courtois writes to a prominent lawyer, an acquaintance of his wife’s, a Royalist, and in touch with the Court, telling him that he had kept back ten pieces among the mass of things found in Robespierre’s house, three of them trinkets, a lock of hair, etc., one or two letters of no importance — and the capital point of all, this letter of Marie Antoinette’s to her sister-in-law. He offers to exchange these against a special amnesty to himself, or at least of a year’s delay before he is exiled, in order, presumably, to allow him to realise his fortune. This is not all: the letter was not written until Courtois’ wife was dead; and it was written on the very day of her death and the moment after it — the moment, that is, after the death of the only person who would presumably know — if he allowed anyone to know — whether he had or had not carefully concealed these documents for so many years. (1) To forge a letter of Marie Antoinette’s is peculiarly difficult. There have been many such attempts. They have been discovered with an ease familiar to all students of her life. This difficulty lies in the great irregularity of her method of writing, coupled with the exact persistence of certain types of letter. She never in her life could write a line straight across a page. She never made two “d’s” exactly the same, and yet you never can mistake one of her “d’s.” She never crossed a “t” quite in the same manner twice and yet you can always tell her way of crossing it. The absence of capitals after a full stop is a minor point but a considerable one. She always brought the lower loop of the “b” up to the up stroke, so that it looks like an “f”; she always separated her ‘Ts” from the succeeding letter. 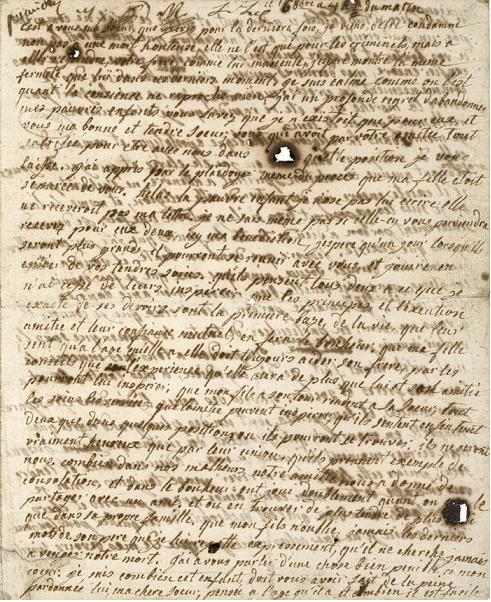 (2) To the faults in grammar and in spelling I should pay little attention — those things are easily copied; but it is worth remarking that on the third line of the letter written in prison she spells the infinitive of “montrer” without the final “r” as though it were a participle, while in the letter written to her brother in 1791 she makes no such error. She puts an “e” in “Jouis” and so forth. All these discrepancies are a proof of the authenticity of the letter. She spelt at random, and her grammar was at random, though she got a little more accurate as she grew older. It would, on the contrary, be an argument against the authenticity of the letter if particular mistakes, discovered in a particular document of hers, were repeated in this last letter from the Conciergerie. It seems to me, therefore, a document absolutely unassailable. The arguments against it are of the same sort which modem scepticism perpetually brings against every form of historical evidence that does not fit in with some favourite modem theory.